By 2019, video-led traffic will account for 80% of the overall Internet traffic. Likewise, nearly 36% consumers say they trust video ads. So consequently, video ads are expected to generate up to $15.4 billion total ad spend. So how do these stats make a difference to publishers? 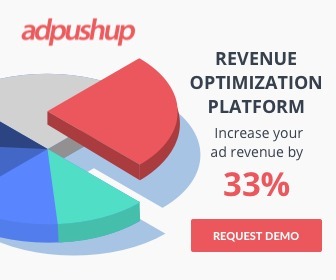 SimpleーPublishers work for revenue, and video advertising is proven just for that. Hence in that context, publishers often seek to understand the difference between VAST and VPAID; both as elements of video advertising. What Is VAST, a.k.a. Video Ad Serving Template? In the simplest form, VAST is a script which empowers video players to run video ads in coordination with ad servers. The purpose of VAST is to programme a video player such that it runs video ads (on different websites and devices viz. mobile, desktop, tablet) in the way publishers want. But how does VAST give the control in publishers’ hands? So how does VAST work anyway? Calling for a request, where the video players calls the ad server asking to fetch an ad. Making a response, where the ad server responds to the video player having the media files along with needed tracking URLs. Triggering the URLs, where the video player launches the tracking URLs/pixels to allow other parties to start tracking and measuring impressions. Introducing VAST 1.0 supporting MP4, 3GP, .MOV, play/stop/pause functionality, and basic event tracking (linear only). Upgrading to VAST 3.0 supporting five ad formats, skippable ads, OBA compliance, and improved error reporting. Advancing to VAST 4.0 supporting separate video + interactive files, mezzanine files, server stitching, viewability, verification, and advanced reporting. After all advancements and upgrades, VAST is currently running at 4.1 available to users. No tech in perfect, so yes. As in case of VAST, ad viewability has often caused a concussion. Until 4.0, VAST did not particularly support the viewability standards, as it should have. Moreover, some lose technical endsーVAST XML parsing error, VAST schema validation error, VAST redirection timeoutーhave prompted arguments on debugging regarding the application of VAST. What Is VPAID, a.k.a. Video Player Ad Interface? VPAID is also a script which allows video ad units to interact with video players. The first level difference between VAST and VPAID is VPAID empowers advertisers to serve rich media, interactive ads to users, which VAST doesn’t. The good part is, VPAID allows advertisers to also record the data on how users are interacting with their video ads. Hence, allowing advertisers to closely refer to different performance measurement metrics and publishers to leverage video ads as a medium of revenue generation. 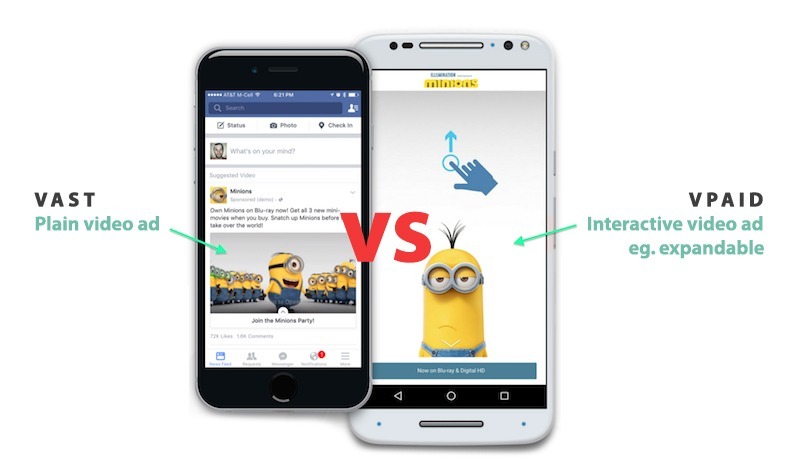 But how does VPAID make interactive ads really interactive? So how does VPAID work? Calling for a request, where the video player requests an ad call from the ad server. Making a response, where the ad server responds to the video player having the VAST XML file along with the VPAID compliant ad unit. Communicating throughout, where the video player and video ad unit constantly exchange properties and events to-and-fro. Tracking activities, where both the video player and video ad unit send the tracked impressions and other activity data to their respective ad servers. Starting with VPAID 1.0, supporting ad rendering on desktop and limited functionality with Flash. Moving to VPAID 2.0, supporting ad rendering on mobile devices, autoplay VPAID on chrome for players smaller than 400×300, wider range of functionality than Flash using HTML5 and JS. Also, again due to its incompatibility with in-app environment, VPAID is probably not considered an apt script because of its chances to propel a longer page-load time on mobile. VPAID is also alleged to ignore large volume of inventory on mobile and smart TVs. VAST vs VPAID: What’s The Catch? For VAST, the adoption of the latest version 4.1 has been a matter of contention due to its incapability to resolve issues like pre-impression based API integration for real-time scoring. Also, as also highlighted above, the version until VAST 4.0/4.1 stood lose in meeting industry viewability standards creating lack of trust in publishers. For VPAID, it uses .SWF format to read elements like images, GIFs, and other interactive elements, which standard formats don’t. However, it’s likely that video player used by publishers may not be able to read .SWF. When this happens, the VPAID script automatically gets overridden by the VAST script ensuring the video ad still gets served. The catch? The ad shalt not support user interactiveness which VPAID is originally designed for. You might be wondering, what do VAST and VPAID share一relationship or differences? Well both. First, let’s clarify on how VAST and VPAID are related. Think of this, VAST (video ad serving template) is an all-in-one CRM/automation platform. It does all the basic operational stuff an office place requires like accounting, call automation, task management, etc. Now, there may be a requirement for feature advancement or customization in the solution which does not come with the standard package. At this point, VPAID enters. Understand this一needing extra features or customizations is an add-on, but not a different entity altogether. Hence, VPAID will make those add-ons possible without replacing the entire VAST setup. At some level, we may call VPAID and VAST as proxy to each other, whenever the situation calls. VAST: Creates a communication bridge between video player and ad server. VPAID: Creates an interaction bridge between video player and video ad units. VAST: To enable video ads to run in the video player in coordination with ad server. VPAID: To serve video ads which are able to interact with the video player as instructed. VAST: Supports standard form of video ads within in-stream videos across all compliant video players. VPAID: Supports interactive form of video ads, playback, etc. within in-stream videos across compliant video players. VAST: Offers uniform way of exchanging data between ad server to video player independent of any technology. VPAID: Offers API integration to facilitate video players to accept more ads independent of the complexity in video advertising. VAST: Doesn’t allow the video player to preload an ad unit before rendering the ad/media. VPAID: Allows the video player to preload an ad unit before rendering the ad/media. VAST: Started from VAST 1.0, followed by 2.0 and 3.0 till the latest VAST 4.1. VPAID: Started from VPAID 1.0 upgrading to the latest VPAID 2.0. VAST: Helps video players understand what to run, how to run, what would be the ad duration, what’s the CTA, to skip the ad or not. VPAID: Helps video ad units to be interactive inside video player like click tabs on the ad, expand the ad, submit a form, take a survey, play a game. VAST: Allows publishers to take control by specifying instructions to video players. VPAID: Allows advertisers to track and measure users’ interaction with the ads. You may choose to make the VAST script manually i.e XML. To do so, you must edit the predefined parameters and add them together to construct a full-fledged XML file for VAST tag. Editing and combining parameters is a more preferred option by ad op developers as it’s less tiresome than coding a new file from scratch. Log in to your Google Ad Manager a/c. Click Inventory, then Ad Units. Locate your video ad unit. Finish the process of selecting tag type, tag options, and tag result; click Continue. As a substitute to method #1 and #2, there are third party tools like Mobileads known as VAST tag generators which create the tags if you choose not to go through the process of creating an XML script file. What you may need to ensure is you clearly communicate the specifications with VAST tag generators that match with your video player to avoid getting errors. Select an HTML5 ad builder. Start creating a banner ad; you may even use d/f formats. Add video to your creative using <video> tag to your HTML file. Close the creative in order to let it fire the events to your (publisher) video player. How is VMAP related to VAST or VPAID, whichever? VAST 3.0 contained a functionality which allowed ad slots to be inserted during long-form video content. However, the control was never given to be exercised by ad creators. And what about MRAID and its relation with VAST or VPAID? MRAID aka mobile rich media ad interface definitions is an API used to cater and favor rich media interactive ads in mobile apps. At some point, a situation that arises is ad makers have to meticulously create ads which play well on both desktop and mobile. Mobile accounts for nearly 70% of digital media time. Hence with MRAID, advertisers are able to serve ads across devices and in all kinds of apps. How it’s related to VPAID is since VPAID allows interactive ads designed using HTML5 or JS, ad creators may use MRAID’s commands to leverage device compatibility. Although, all ad creators or ad ops developers don’t go with MRAID blindly. Sometimes, they end up creating their own framework to combat the device compatibility matter. Writing anything about videos in ad tech is great! There’s just so much data to fall for. Therefore, for a topic like this, I’d like to sum up with some more of it. An average Internet user spends 88% more time on a website that has videos. 73% consumers say they made a purchase after watching its video. 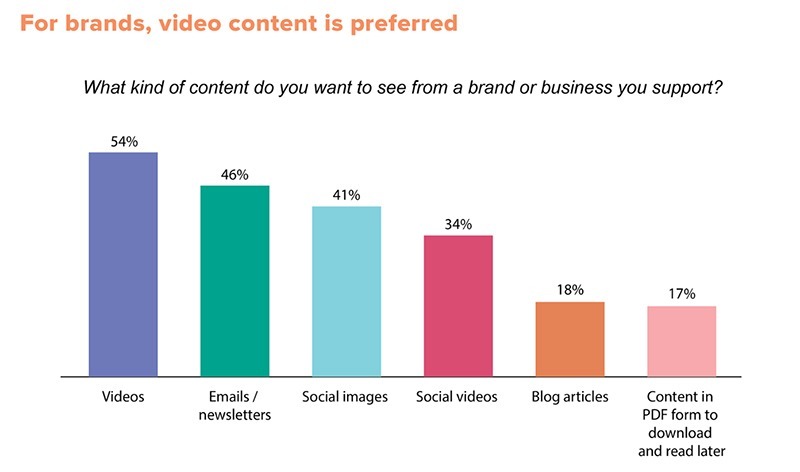 73% marketers say they find videos positively impact their ROI. Users are now watching 71% more videos than they were watching last year. 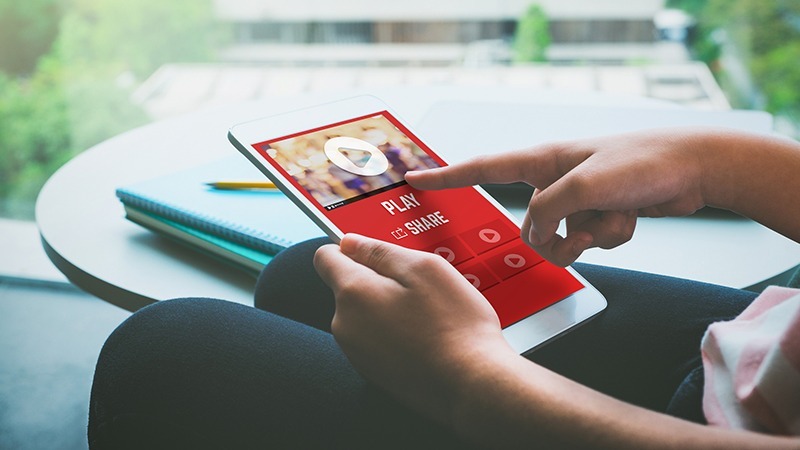 While the prima facie seems that videos are on the roll, the technical aspect of video advertising is going through a overhaul. These day-to-day advancements are leading to betterment and need for troubleshooting at the same time. Either way, video ads are growing and they are growing like anything. As a publisher, if you’re not prepping for video ads yet, your website monetization strategy is probably lacking. However with developments like VAST, VPAID accompanied by VMAP and MRAID, publishers are given more control, scope, and bandwidth to monetize using video as a medium. By now, I hope the difference between VAST and VPAID is not that complex as it may have seemed first. Lastly, what’s surprising to me is, to what extent will these technologies go, and what upgrade will we see next?